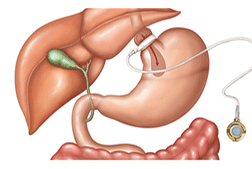 With laparoscopic gastric bypass surgery, a small pouch is created, about the size of an egg, from the upper portion of the stomach. 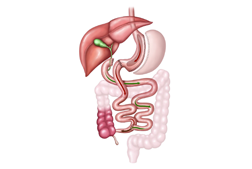 The small intestine is divided about 15 to 20 inches from the stomach and one end is attached to the small pouch. 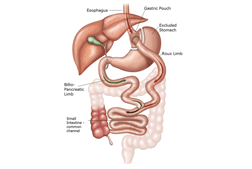 The remaining lower stomach and bypassed intestine are reattached to the small intestine at the point of separation. This surgical procedure reduces the stomach by 25 percent of its original size, by surgically removing a large portion of the stomach. The open edges are then attached together with staples to form a sleeve or tube with a banana shape. This procedure permanently reduces the size of the stomach. 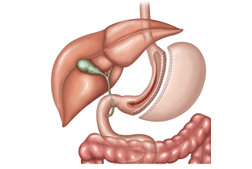 The procedure is performed laparoscopically and is not reversible. Without any stomach cutting or stapling, the band reduces your stomach's capacity, restricting the amount of food you are able to eat at one time. Plus, you feel full faster and stay full longer, so you wind up eating less. This helps you gradually lose weight and keep it off. So you can live a healthier life - for your children, your family and yourself. There are multiple reasons why patients can see inadequate results with previous weight loss surgeries. If patients have had inadequate weight loss, persistence of medical problems related to their weight, or subsequent weight regain they may be candidates for revisional bariatric surgery.